The Third Auction – Everything from #1 and #2 and then some! A member of the Chilehead community for years, David “Hudd” Huddleston and his family have fallen upon hard times financially. This third auction is a continuation of the community’s support of Hudd. 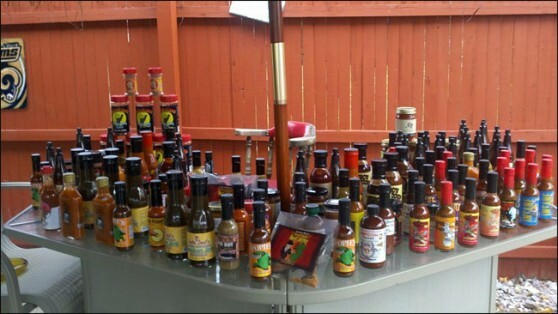 To raise funds to help out Hudd, dozens of Hot Sauce manufacturers have donated products to include in the auctions. Auction #1 was a big success, with the winner donating all items right back into Auction #2. Auction #2 was won by Chris from InsaneChicken.com who promptly re-donated it all back into this HUGE third auction. Auction #3: This auction features no less than 166 bottles of hot sauce, 1 gift card, 6 boxes of Jerky mix and plus 1 pound of Jerky! An incredible collection of products. So far, over 400 dollars have been raised… and this exciting third auction will help the funds go a lot further! • Full Product line from our Crazy Uncle Jester: 12 bottles! Shipping is FREE on this giant collection of hot sauces and goodies, so bid generously and often! Wow that is a lot of great hot sauce up for grabs!